Nursing Home Finder offers comprehensive information about care, safety, health inspections, staffing and more for almost all nursing homes in the country. With this tool, users can easily conduct a customized search for a highly rated nursing home by location, Medicare and Medicaid coverage, Alzheimer’s care and size. The Nursing Home Finder reflects U.S. News’s analysis of data collected and published by the federal government using a methodology defined by U.S. News. 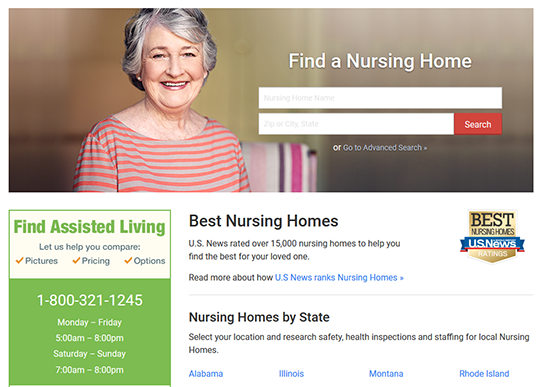 U.S. News’s Nursing Home Finder is a tool for individuals and their families beginning their search for senior care and should be used in consultation with their medical professional.